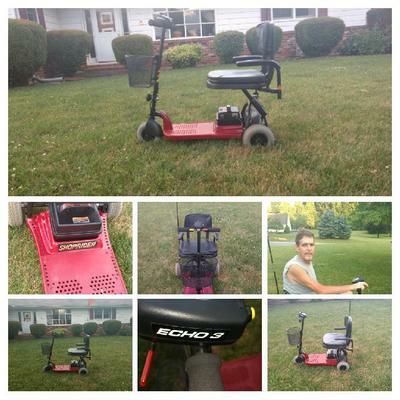 The used Shoprider mobility scooter for Sale is an Echo 3 ShopRide Mobility Scooter that was very gently used for just a few years. The electric scooter runs off of a (1 year old) rechargeable battery. I would rate this scooter as in good to excellent used condition. Top speed would be somewhere in the range of about 3.8 mph and load limit would be up to 250 lbs. The used Shopride scooter is in Mount Airy, MD Maryland and my price is $450 or you can submit your best offer using the form provided by GoGoCycles Used Motorcycles for Sale.